Description: All the way from Wyoming, this BNSF unit coal train is just back from offloading Powder River coal at a Plant Scherer, near Macon. Here, it is shown at Reeves. Description: Watching a pair of BNSF AC locomotives pull a train of coal car empties into the yard. Description: At the head of a loaded RWSX coal train. Description: DPU on this empty UCEX coal train. Description: CSX Q386 overtakes a tied-down N859 coal train at Lloyd Rd. 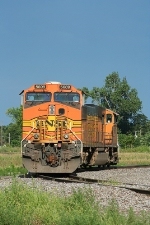 Description: BNSF 5609 sits in the lumber mill siding in Old Monroe, Mo. under all the stars as the lead unit on the U BIRSEM0 37 while the rest of the train is parked at the Gibb Siding south of town. The lumber mill left all their lights on at this end of the plant this weekend and helped illuminate the old grain elevator. Description: Sitting in the lumber mill siding in Old Monroe, Mo. on the BNSF Hannibal Sub. Description: NS 9835 leads this Memphis to Galesburg freight north through Old Monroe, Mo. on the BNSF Hannibal Sub as it passes BNSF 5609 which is parked in the lumber mill siding.